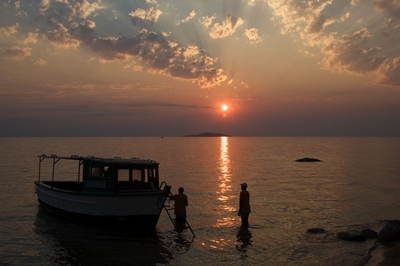 The Lake Malawi is situated in the East African Rift Valley. It is the world’s eighth largest lake and Africa’s third largest and deepest. The lake features fresh water inhabited by a good number of fish species compared to other lakes in the world. The Lake Malawi covers an area of about 29,600 square kilometers and it measures 580 kilometers long with 75 kilometers wide. The lake also shares its borders with Southern Tanzania, Eastern Malawi and Western Mozambique. Lake Malawi is 350 km from the Lake Tanganyika. Malawi features the largest part of the lake, where a quarter part of the lake is situated in Mozambique bounded by the Chizumulu and Likoma Islands. There are a number of disputes about the lakes name where the common name is Lake Malawi and in the international maps the Lake Malawi is mentioned as “Lake Nyasa”. The Lake Malawi features immense wildlife that includes monkeys, hippopotamuses, crocodiles and large population of African Fish Eagles that feed on the fishes here. Lake Malawi is also well known for its cichlids that are famous in the fish trade. In addition it is also famous for its unique snails that causes bilharzia, a parasitic disease. Also there are certain holiday spots close to the lake. The major attractions here are swimming, scuba diving, boat rides and the local food. This has really helped me with my geography project, so I would like to thank the author. Cool. Have a g scouts project on Malawi and really appreciate the help. 🙂 thx.